This article is about the baseball player. For the biathlete, see Fredrik Lindström (biathlete). 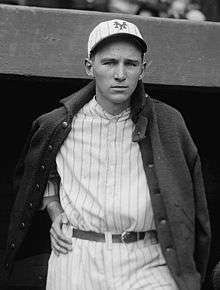 Frederick Charles Lindy Lindstrom (November 21, 1905 – October 4, 1981) was a National League baseball player with the New York Giants, Pittsburgh Pirates, Chicago Cubs and Brooklyn Dodgers from 1924 until 1936. He was inducted into the Baseball Hall of Fame in 1976. At the age of 23, Lindstrom hit .358 for the Giants and was named The Sporting News Major League All Star team's third baseman ahead of Pittsburgh's Harold "Pie" Traynor. Two years later, he repeated the honor while scoring 127 runs and batting .379, second only to Rogers Hornsby among right-handed batters in National League history. In 1931, though, injuries including a chronic bad back and broken leg, brought about his switch to the outfield where for several years he remained an above-average but no longer All Star player until his retirement after 13 seasons in 1936. Born on Chicago's South Side not far from Comiskey Park, Lindstrom as a youngster was an ardent White Sox fan, often playing hooky from school to watch their games. He was devastated when his hero, Shoeless Joe Jackson, and other teammates were banned from baseball for allegedly throwing the 1919 World Series. Three years later, after a tryout with the Cubs didn’t pan out, he signed a contract at the age of 16 with the New York Giants. A sophomore at Chicago's Loyola Academy at the time, he was assigned to the Toledo Mudhens where he played for two years with such future Giant teammates as Travis Jackson and Bill Terry. Called up in 1924 and eventually replacing the injured Heinie Groh at third base, 18-year-old Lindstrom batted .333 in the World Series including four hits in one game against Washington's Walter Johnson while playing errorless in the field. The youngest player ever in a post-season game, he was described by Johnson after the fifth game as "a wonder, easily the brightest star in this series." But a bad-hop bouncer over his head in the 12th inning of the seventh game gave the series to the Senators and became an enduring moment in baseball lore. "So they won it," Lindstrom later recalled. "(Giants pitcher) Jack Bentley, who was something of a philosopher, I think summed it up after the game. ‘Walter Johnson,’ Bentley said, ‘is such a loveable character that the good Lord didn't want to see him get beat again.’"
Playing in an era when fielders’ gloves were little more than padded strips of leather with a baseball-sized pocket in the palm, Lindstrom for three of the next four seasons led National League third basemen in fielding percentage. He also topped the league in assists in 1928, finishing second with 34 double plays and 506 total chances. All while posting 231 hits in both 1928 and 1930 including nine hits in a double header, a record never surpassed to this day. A million-dollar infield," said writer Arnold Hano of the late-1920s Giant quartet. "Fans would come early just to watch their fielding-practice magic." In an essay on Willie Mays’ famous 1954 back-to-the-plate catch off Cleveland's Vic Wertz, Hano claimed that an even more sensational play was Lindstrom's full-length, leaping grab before crashing into the outfield wall in a 1932 Giants-Pirates game that the New York Herald Tribune later called "the greatest catch ever made in the Polo Grounds." During his nine seasons with the Giants, Lindstrom batted .318 (fourth on the team's all-time list in the 20th century), while demonstrating his ability to come through in the clutch with pennant-chasing hitting streaks in September 1928 that raised his average from .342 to .358 and in 1930 from .354 to .379. As late as 1935 while playing center field for the Chicago Cubs, his .427 batting average during a stretch of 21 consecutive victories was credited by such Chicago newsmen as John P. Carmichael and Warren Brown as the main factor in the Cubs’ drive for the NL championship. Often referred to as "the last of the great place hitters" on McGraw teams that emphasized advancing runners into scoring position rather than relying on the long ball, Lindstrom in 1931 was led to believe that he would succeed the long-time Giants manager. "We’re making that change we spoke about next year," Lindstrom, recuperating from a broken leg, said he was told by Giants’ club secretary Jim Tierney. "McGraw is going out and we want to make you manager." Instead, for reasons that some traced to Lindstrom's leadership role in a player revolt against their often dictatorial manager (a charge he consistently denied, although admitting that he often spoke out against the feisty skipper nicknamed Little Napoleon), club owner Horace Stoneham chose first baseman Bill Terry to replace McGraw. Although the two remained friends, Terry traded Lindstrom to Pittsburgh in 1933 because, Terry said, "Fred no longer has that burst of speed he used to have." Playing in the outfield between Lloyd and Paul Waner, Lindstrom regained his elite status as a player by finishing second on the Pirates to shortstop Arky Vaughan by four percentage points with a .310 batting average (eighth highest in the National League), hitting 39 doubles and leading the league's center fielders with a .986 fielding average. But after one outstanding season, Lindstrom again found himself involved with a team expected to contend for a pennant struggling with controversy. First, George Gibson was fired as manager 51 games into the season with the Pirates mired in fourth place. His replacement, Pie Traynor, moved Lindstrom to left field and then to the bench after breaking his finger in a fungo game. At season's end, despite fielding .990 and again outhitting Lloyd Waner while playing in 43 fewer games, Lindstrom was traded to the Chicago Cubs where he quickly became what Cubs manager Charley Grimm later called "a vital asset" in the team's 1935 league championship. Starting at third base ahead of Stan Hack, he was later shifted to fill a void in center field. There, Grimm said, as boss of the outfield he allowed only seven pop flies to fall safely during that 21-game streak. He also drove in the winning run, or scored it, in seven of the games including three singles and a double off Dizzy Dean of the St. Louis Cardinals in the pennant-clinching contest. "And why isn’t Lindstrom in the Hall of Fame?" Grimm asked in a 1968 interview. In later years, Lindstrom managed minor league teams at Fort Smith, Arkansas, and Knoxville, Tennessee. After coaching the Northwestern University baseball team for 13 seasons, he was appointed postmaster of Evanston, Illinois, a position he held until 1972. He died nine years later and is buried with his wife, Irene, in Chicago's All Saints Cemetery. The youngest of their three sons, Chuck Lindstrom, played briefly for the 1958 Chicago White Sox, hitting a sacrifice fly, walking and tripling for a perfect 1.000 batting average in three plate appearances. Although many modern-day baseball historians refer to Traynor as the era's premier fielding third baseman, the Pirate Hall of Famer led the league in errors five times including 37 in 1931 and 27 in both 1932 and 1933. Lindstrom's high mark was 21 errors in both 1928 and 1930. For the seven comparable seasons that Lindstrom played third base, his fielding percentage tops that of Traynor each year. McGraw's list shows no bias for Giants, naming only Hornsby at No. 7 in the Top 10 and the great Christy Mathewson at No. 16. The first five, in order, were Honus Wagner, Ty Cobb, Willie Keeler, Eddie Collins and Babe Ruth. No other third baseman was cited. Lindstrom's four hits stood as the rookie record until matched by San Francisco's Buster Posey in the 2010 series. Lindstrom was included in the balloting for the National Baseball Hall of Fame starting in 1949, but he never received more than 4.4% of the vote from the Baseball Writers' Association of America (BBWAA). Former Giants teammates Terry and Frankie Frisch joined the Veterans Committee in 1967, and aided the elections of several of their former teammates, including Jesse Haines in 1970, Dave Bancroft and Chick Hafey in 1971, Ross Youngs in 1972, George Kelly in 1973, Jim Bottomley in 1974, and Lindstrom in 1976. Lindstrom's selection, along with some of the other selections made by Terry and Frisch, has been considered one of the weakest in some circles. According to the BBWAA, the Veterans' Committee was not selective enough in choosing members. Charges of cronyism were levied against the Veterans' Committee. This led to the Veterans Committee having its powers reduced in subsequent years. In 2001, baseball writer Bill James ranked Lindstrom as the worst third baseman in the Hall of Fame. ↑ The Sporting News, Dec. 5, 1928. Reach Official American League Baseball Guide, Philadelphia, 1928. pp. 64, 67. ↑ International News Service, New York, May 7, 1930. ↑ Babe Ruth, Christy Walsh Syndicate, July 5, 1933. ↑ New Bill James Historical Baseball Abstract, Free Press, 2001, p. 127. ↑ William Hennigan, New York World, Feb. 15, 1929. ↑ Kenneth Smith, New York Evening Graphic, Feb. 18, 1928. ↑ Joe Foley, This Sporting Life, 1930. ↑ Broeg, The Sporting News, March 17, 1973. ↑ Donald Honig, The October Heroes, Simon & Schuster, 1979, p. 257–9. ↑ John K. Eichmann, Sports Scoop, January 1974, p. 6. ↑ John Leventhal, The World Series, Black Dog Publishers, 2001, pp. 66–69. ↑ Walter Johnson, Christy Walsh Syndicate, Oct. 9, 1924. ↑ Honig, The October Heroes, p. 278. 1 2 Freddie Lindstrom, BaseballReference.com. ↑ Arnold Hano, A Day in the Bleachers. Da Capo Press, 1954, p. 168. ↑ Sports Scoop, pp. 7–8. ↑ "Grimm Calls ’35 Cubs His Best", Chicago Tribune, September 2, 1968, p.2 Sports. ↑ Hano, Greatest Giants of Them All, p. 178. ↑ Honig, The October Heroes, pp. 266–67. ↑ Joseph Durso, The Days of Mr. McGraw. Prentice-Hall, Inc., 1969, p. 213. Anthony J. Connor, Baseball for the Love of It, MacMillan, 1982, pp. 94–95. ↑ Hano, Greatest Giants of Them All, p. 195. ↑ Sports Scoop, p. 8. ↑ "Grimm Calls," Chicago Tribune, September 2, 1968, p.2 Sports. ↑ "Grimm Calls", p. 2 Sports. ↑ Tot Holmes, Dodgers Blue Book, 1981, p. 34. Fred Stein, Mel Ott: The Little Giant of Baseball, McFarland & Co., 1999, p. 146. ↑ Connor, Baseball for the Love of It, pp. 266–67. Freddie Lindstrom, SABR Encyclopedia, June 25, 2010. Freddie Lindstrom, Baseball Reference.com. ↑ Dave Reidy, The Morning News (online), September 26, 2003. ↑ Smith, "Sports of the Times", New York Times, Jan. 28, 1975. ↑ Kieran, New York Times, undated 1930. ↑ "Freddie Lindstrom Statistics and History". baseball-reference.com. Retrieved June 19, 2012. ↑ "This Annotated Week in Baseball History: April 8–14, 1897". Hardballtimes.com. Retrieved 2012-06-18. ↑ Jaffe, Jay (July 28, 2010). "Prospectus Hit and Run: Don't Call it the Veterans' Committee". Baseball Prospectus. Retrieved November 3, 2011. ↑ Jaffe, Jay (July 28, 2010). "Prospectus Hit and Run: Don't Call it the Veterans' Committee". Baseball Prospectus. Prospectus Entertainment Ventures, LLC. Retrieved June 11, 2012. ↑ "Baseball Brouhaha Brewing". The Evening Independent. January 19, 1977. p. 1C. Retrieved November 3, 2011. ↑ Sullivan, Tim (December 21, 2002). "Hall voter finds new parameters unhittable". The San Diego Union Tribune. p. D.1. Retrieved November 3, 2011. (subscription required (help)). ↑ Booth, Clark (August 12, 2010). "The good news: Baseball Hall looking at electoral revamp". Dorchester Reporter. Retrieved December 21, 2011. ↑ James, Bill (2001). The New Bill James Historical Baseball Abstract. Wikimedia Commons has media related to Freddie Lindstrom.